Front desk staff were amazing! Very friendly and accommodating. Where to find Elora hotels near an airport? Where can I find hotels in Elora that are near tourist attractions? Are you after an apartment or hotel in downtown Elora? Within a 0.1-kilometre (0.1-mile) distance of its central area, there are 3 Expedia-listed hotels. The Village Inn is one of the most conveniently situated options, as it's one of a small number of choices within an easy stroll of the Elora center. 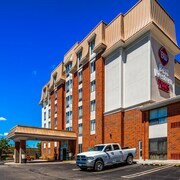 The Courtyard by Marriott Waterloo St. Jacobs can be found 20 kilometres (12 miles) from the main part of Elora. 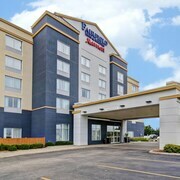 Or, alternatively, the Holiday Inn Express Hotel & Suites Waterloo - St Jacobs can be found 20 kilometres (12 miles) away. 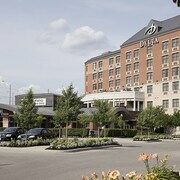 The Delta Hotels by Marriott Guelph Conference Centre and also the Waterloo Inn Conference Hotel are two other recommended options around Elora. Once you have explored Elora, you should make time to discover the wider region of the Southern Ontario area. Photograph Southern Ontario's beaches. You could also spend time at the area's traditional villages, churches and art museums. Adventurous visitors may enjoy skiing here. Looking for more things to do? Consider spending some time enjoying the University of Guelph and Stone Road Mall in Guelph, 20 kilometres (12 miles) to the southeast of Elora. 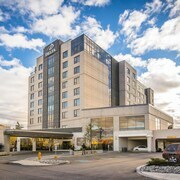 If you'd like to spend a few nights in Guelph, be sure to check out the Holiday Inn Guelph Hotel and Conference Centre and Days Inn - Guelph. 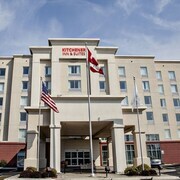 Alternatively, you could consider staying in Kitchener, 25 kilometres (16 miles) to the south of Elora, where you can pick from the Comfort Inn Waterloo and Crowne Plaza Kitchener-Waterloo. Centre In The Square and theMuseum are a couple of the most popular sites to see when you're in Kitchener. 55 kilometres (34 miles) from Elora is Stratford, a regional center with a population of 30,000, home to great attractions like the Stratford City Hall, the University of Waterloo Stratford Campus and the Stratford Municipal Golf Course. You might like to also visit the Avon Theatre and the Gallery Stratford. If you'd like to stay in Stratford, check out the rates and amenities at the Westover Inn - An Ontario's Finest Inn and Stone Willow Inn. Expedia's destination page is also a very good way to discover more about Elora. With a mixture of culture and outdoor experiences, Elora has something for everyone. The area boasts beautiful hiking on the Elora Cataract Trailway and the nearby Trans Canada Trail. History buffs can experience the local mill--the last one in Ontario—where they can have lunch or lodge at one of the most popular Elora hotels. Art walks and productions in the Gorge Theatre add to the cultural offerings. Elora has mild temperatures year-round, with average summer highs of around 15 degrees Celsius and winter highs around 10 degrees. The Elora Gorge is a popular spot for hikers and kayakers. The Grand River cuts through the gorge and flows downriver near Kitchener, Waterloo, and West Montrose. Visitors should make time to visit the shops, art galleries, and mill near the Tooth of Time, the area's famous waterfall. 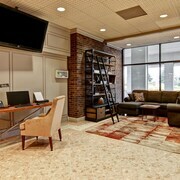 Choosing to stay at the right Elora hotel is a great start to your vacation. With Expedia.ca, you can find discounts on more than just hotels in Elora. Compare rates on top Elora flights, find deals on cheap car rentals, and save even more when you book a complete vacation package. With the Expedia Best Price Guarantee, you can make sure that you're making your budget work for you. What are the most popular Elora hotels? 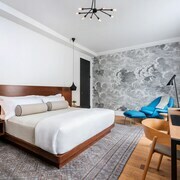 Are there hotels in other cities near Elora? 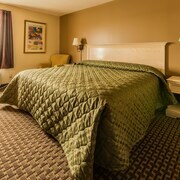 What other types of accommodations are available in Elora? Explore Elora with Expedia.ca’s Travel Guides to find the best flights, cars, holiday packages and more!